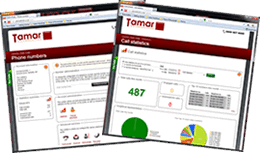 Managing your calls more effectively becomes easy with virtual telephone numbers from Tamar Telecommunications. One of the included free features is the call statistics package. Call statistics are very useful for tracking how well your advertising is working for you, as well as to see how busy you are and how many calls you may be missing. The call statistics home page gives a snapshot of the current months calls so far for the account. This includes total calls this month, engaged calls, unanswered calls and the top ten numbers this month by volume of calls. Pie charts give a clear graphical representation of the current month’s calls. Many businesses advertise their products or services in all kinds of ways, but do you really know which advertisements actually work? By using a different telephone number in each advert, you can see from your online call statistics, which adverts are receiving the most calls and which receive either no or very few calls. The small price of having a different number in each advert could save you hundreds of pounds in advertisements that don’t bring in the results you need. The money that you save can then be used to expand on your successful advertisements/areas that are successful for you. Call statistics reports can be generated for all numbers, a specified number/prefix, hunt group, or by entering the description assigned to a number, for example Manchester Evening News Advert . The date range can be set either by selecting from and to dates from the calendar or by using the date range drop-down which has pre-set start and end dates, such as today, yesterday, last seven days. This report generates a list of calls for the selected from and to dates including; start date/time, calling number, caller location, called number, destination, call duration and whether the call was answered/engaged/not answered. This report enables you to download the data for the selected from and to dates as a .csv file. This can then be imported into your own software should it be required. The following reports show how many calls have been received to a number and account overall. The reports can also help to identify your busiest times of the day, week, month and year. This information can be useful for ensuring that you have enough staff available to answer your calls at busy times. The reports breakdown the calls into answered, engaged, unanswered and total calls. The number-of-calls reports are as follows and can be viewed as a table or graph. The report shows the number of calls received based on the time of day. The report shows the number of calls received based on the day of week. The report shows the number of calls received based on the day of month. The report shows the number of calls received based on the month. This report help to identify your busiest times of the day, week, month and year by volume of minutes. This information along with the number of calls report can be useful for ensuring that you have enough staff available to answer your calls at busy times. The number-of-minutes reports are as follows and can be viewed as a table or graph. The report shows the number of minutes received based on the time of day. The report shows the number of minutes received based on the day of week. The report shows the number of minutes received based on the day of month. The report shows the number of minutes received based on the month. This report shows numbers that have received calls during the specified from and to dates. The calls are broken down into; answered, engaged, unanswered, total minutes and total calls. The report can be sorted by each column in both ascending and descending order as required. To view more details on a particular number, select the number from the list. This will produce a report for the individual number, listing each call received to the number. We have recently introduced some new call statistics reports, based on previous customer feedback. If your organisation has a particular type of report that you and other customers would find useful, please let us know via our contact us page.